Why does one particular hop in the route often show a really bad time (or doesn't respond at all) - but the hop right after it performs well? Some routers just don't prioritize timed out ICMP requests very high (ICMP requests where the TTL equals 0 after reaching them). If the hop right after consistently performs well, just don't factor this hop into your troubleshooting equation (i.e. ignore it). In the screenshot above, hop 4 is a great example of this - hop 4 shows packet loss and high latency, but downstream hops (5- 11) look great. Since data getting to hop 5 needs to go through hop 4, this is normal and it's not anything that needs to be chased as a problem. Hop 2 is another example of this. Another possibility here is that an intermediate hop might use a return route that is different than the hop following (or the final destination). This can mean there is a problem with one return route but not another. Since each hop makes its own decisions about routing, this can definitely happen. The important thing to remember is that the only thing that really matters is the final destination. 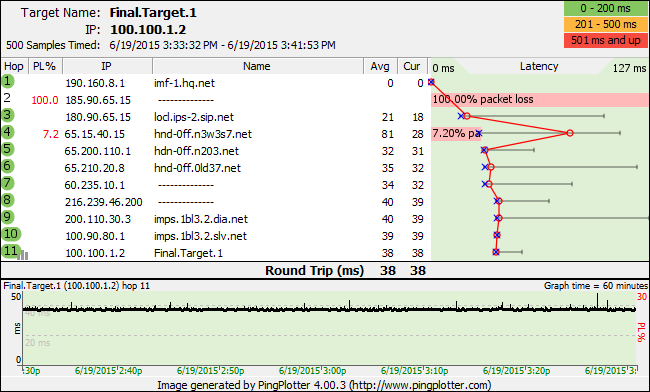 If the final hop is showing 0% packet loss and acceptable latency, then all the hops before that can show all kinds of errors and as long as the final destination isn't affected, then this is an artifact of router configuration, and there is no problem. The only hop that really matters is the final destination - the rest of the data at intermediate hops is only useful when there is problems at the final destination - then you can look at intermediate hops to determine the cause of the problem. If a particular hop is showing 100% packet loss, it might just not be configured to return packets to the sender when TTL=0 (we rely on this to get information about intermediate hops). Having one or more non-responding intermediate hops is very normal and doesn't indicate there is a problem. If everything else looks good, just ignore those hops.